Introduction: Witches and vampires draw much attention on Halloween day, in the Harry Potter novels, and in vampire movies. Whether or not they believe in them in a religious sense, many people nowadays simply assume that sort of world and witchcraft might exist somewhere. Personal preference, imagination, and imitation to witchcraft simply cause a grudging complaint from Christianity. In the medieval world, alleged magicians and witches were out there but their activity was restricted by the watchful eyes of the church. Witchcraft refers to a certain power that generates a supernatural phenomenon by means of humans, often called witches, not directly by means a divine being. Witches were believed to conduct various harmful deeds in society and to the church with the help of devils. Witchcraft frequently appears to be related to a diabolic power, to magic, and to evil in a negative and pejorative sense. A witch is often described as someone who invokes evil passion, brings calamity, and even calls up the dead. 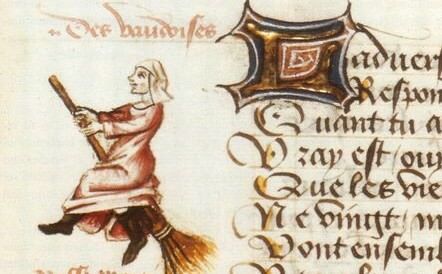 Witches were believed to have the power to cast magic spells, dance with the devil, and ride brooms to attend at the Sabbath. Are witches realities, fantasy, fiction, or the presumed belief-system of certain people? Documents and stories from the middle ages tell that people conducted black masses and worshipped strange gods. In spite of the controversy over the factuality of phenomena, many people seemed to regard witchcraft as a genuine experience, whether religious, cultural, or psychological. Coexisting and competing with pagan beliefs and sorcery in medieval Christianity, witch trials and related controversies came to the forefront in the 14th– 15th centuries, and reached its peak between the 16 and 17th centuries. Richard Kieckhefer’s “Calendar of Witch Trials” tells that witchcraft was a wide phenomenon in the 1300–1500. This was the beginning stage of the witch controversy, but it provided a real momentum for further witch trials. Even if Kieckhefer’s use of the term witchcraft includes sorcery, invocation, diabolism (similar to witchcraft), we can see that witchcraft emerged as a major issue in late medieval Christianity.